Libreria Acqua Alta, a unique book store in Venice. Wandering around Castello, we came across the Libreria Acqua Alta, a bookshop whose welcome sign says that it is “the most beautiful Bookshop in the World”. To me, that was like waving a red flag to a bull as I thought that I had already recently seen the most beautiful bookshop in the world, the Lello Bookshop in Porto, Portugal. So, we had to go into the Libreria Acqua Alta to check it out. The table at the entrance, with a somewhat untidy pile of old prints and postcards looks pretty ordinary. However, once you enter the Libreria Acqua Alta, the uniqueness of the shop unfolds before you. The bookshop bulges at the seams with books stacked from floor to ceiling. The fascinating shop comprises a few small rooms whose walls are covered with books. 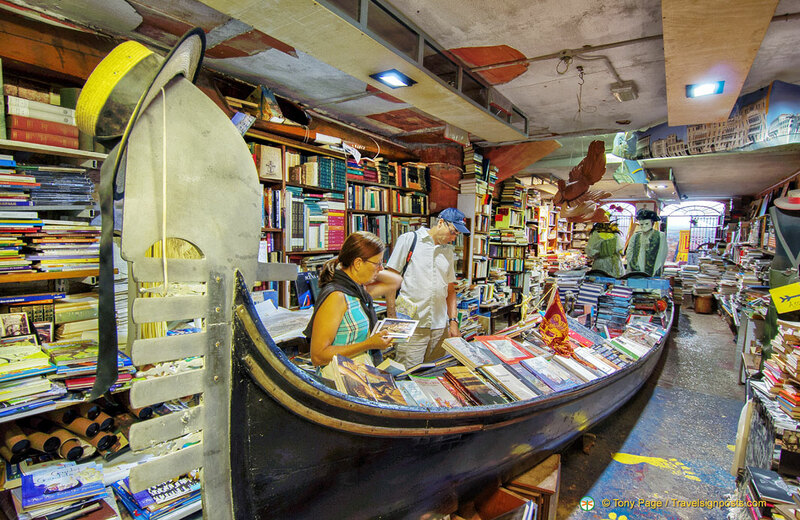 There is also a bathtub, a boat and a gondola filled with books – the high tides of Venice do flood the shop and storing the books in vessels that will keep them dry is a great idea. of the place. If you’re after crime or thrillers, look at the stack of novels in the boat – books by Frederick Forsyth, John Le Carre, Wilbur Smith and Martin Cruz Smith’s Gorky Park are all stacked here. In addition to the novels, biographies and reference books, you’ll also find plenty of maps and travel guides and some quirky souvenirs like “old Casanova condoms”. This is a kind of bookshop that’s nice to lose yourself in and you’ll never know what you’ll find in the organized chaos. As we were browsing the shop, Luigi Frizzo, the owner of the bookshop came up to us and invited us to take a look at the book steps at the back room. It felt sacrilegious to walk on the books but Luigi insisted that we climb to the top to have a ‘wonderful view’ of the canal. He also urged us to take a look at the Fire Exit – which takes you right into the canal. Apart from being eccentric and affable, the man’s got a great sense of humour. If you’re in the Castello area, Libreria Acqua Alta is worth a visit as Luigi loves people going into his shop. Even cats are welcomed and he seems to have adopted a few strays in his shop. Libreria Acqua Alta is open from 9:00 to 19:30 during the week. See more photos of Libreria Acqua Alta at Travelsignposts Castello album Here. Hi Rachel, Luigi didn’t mention his B&B to us, otherwise we would have checked it out. Thanks for sharing. Yes, Acqua Alta is indeed a wonderful bookshop and Luigi a really lovely character. Rachel, I did the same thing in 2006. My kids were really young and they played with the kittens for hours in the bookstore. When we were leaving my son saw the B & B sign so we asked about it and my kids asked if we could rent it. We paid a big penalty at our hotel when we left and stayed at the B&B. It wasn’t the cleanest so I spent a few hours cleaning the kitchen so I could cook in it. It’s so close to the stores and I bought meats at the butchers which were so close and while waiting, watched a woman order pounded chicken breasts so I made Chicken Cordon Bleu for us and for the other guests there. I’d been dragging my kids from gallery to gallery and from site to site throughout Europe so they were exhausted and were quite happy to sit around the unit. We took the room with the bathroom and played the board games and the like that were there. It really was fun. It actually has a great view of the canals if the windows were just a little larger. Luigi’s a great guy. Inside the library there is a Francesca’s gondola commissioned by countess Isabella for her doughter in 1885. A truly venetian story. Very lovely….. Thanks for sharing Marta. We’ll be back there in a couple of weeks and will be able to see if the steps have deteriorated even further.